Baby quilt I need to finish up. How do you think i should quilt it? It looks better in person. i love using my walking foot and this only needs to be quilted every 10". I like to quilt closer though. I can do very simple FMQ. I would love some ideas. That is really cute! I don't have any quilting ideas for you but I'm sure someone will! Love the colors! This is adorable! I love that you used yo-yos. I am listing a site that I just stumbled upon this week. She describes many different ways of using a walking foot. Maybe give you some ideas. I love it! So cute! Love the calico and red/yellow colors and the buggies are darling. What size is the quilt and the blocks? I would do the eco quilting around the carriages, and feathers in the boarders. I would quilt baby bottles in the four patch blocks, good luck to you, and your baby quilt. I love this quilt! It's different and so cute. I don't do fmq or use a walking foot to quilt, but if I did, I think I would quilt around the baby carriages and wheels, do some stippling around the baby carriages, and put heart on the 4 patches - one in each patch and all points meeting in the center of the 4 patch. Now I've run out of ideas - I have no clue what to do with the borders! Love this website. My blocks are 9" and borders are 4.5"
maybe stitch in ditch its very cute!!!!! My favorite is FMQ, what I do most often on all my quilts. Beautiful baby quilt. So darling, I think maybe an E2E would be nice. In the 4 patch and border you can do a meandering design and in the carriage block you can do some echoing. the quilt is so adorable!! Such an adorable quilt! I love the yo-yo's for the wheels too! I like QM ideas - especially the words You Are My Sunshine around the border. Your quilt is darling! I agree with the echo design around the carriage and then cross-hatch the four patches. I would stitch in the ditch to stabalize it, both horizontally and vertically, then I would do free motion around the buggies to make them pop out, then some simple stippling around the borders. That should do it! Good luck! I love the stippling around the carriages. It will make them pop. How about circles inside the wheels? More stippling in the border would be simple. I agree. This is a lovely baby quilt. Love this cute little quilt. Thank you for posting it. 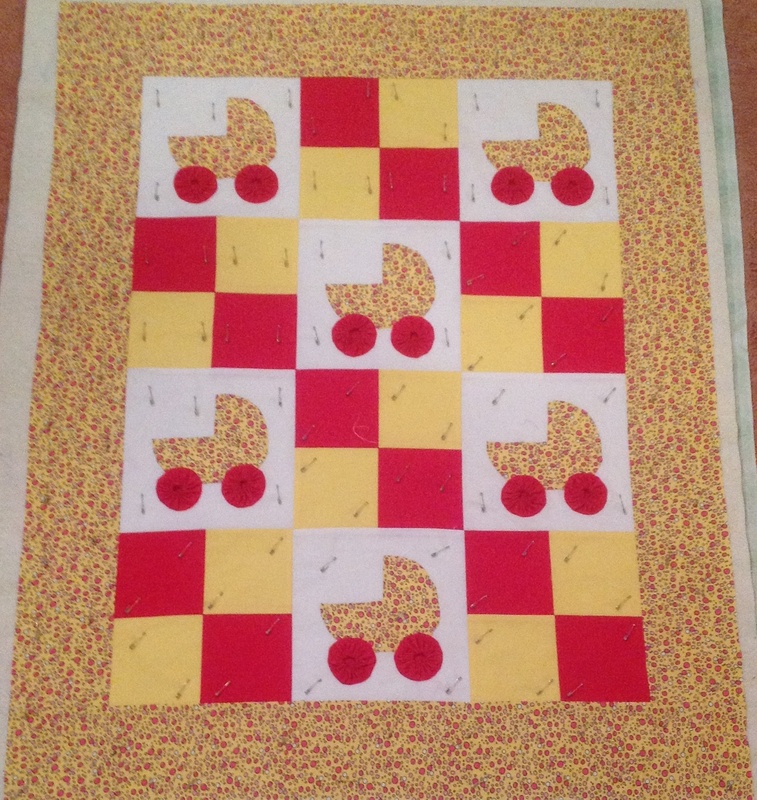 I would outline the baby carriages, SITD the 4 patch and FMQ the border. Not as creative as some other suggestions but I haven't been quilting that long.